India is taking significant steps towards improving rare diseases policy and care for patients. Last month, the Indian Government allocated a fund of 1,000,000,000 Indian Rupee (12,500,000 Euros) towards treatment of rare diseases and has established a Committee that will identify and provide accreditation to medical facilities where diagnosis and treatment for rare diseases can be done. The creation of a Rare Disease Board who will review the patients’ applications submitted through a dedicated governmental website is also planned. Health is a state subject in India so state wise implementation should now follow. The Government will contribute with 60% of the funding and each accredited medical centre with the remaining 40% for the treatment. 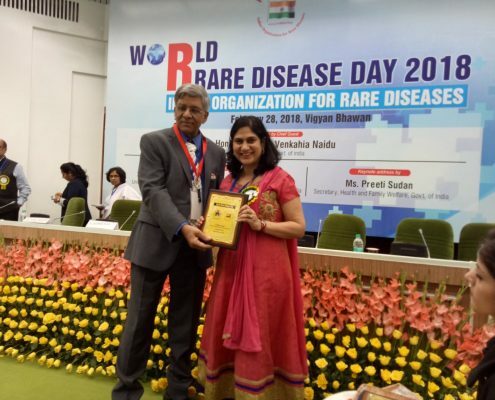 The Indian Patients Society for Primary Immunodeficiency (IPSPI) supported Rare diseases Day by participating in the event conducted by Indian Organization for Rare diseases at the Governmental Convention center Vigyan Bhavan in New Delhi. The event was inaugurated by Chief Guest Hon’ble Shri M. Venkahia Naidu, Vice President of India, in August presence of Shri Jagat Prakash Nadda, Union Minister of Health and Family Welfare, Dr Jitendra Singh, Minister of State, and Ms Preeti Sudan, Secretary, Health and Family Welfare department. Rubby Chawla, Founder and President of IPSPI, was one of the speakers in the panel discussion on Patient perspective.